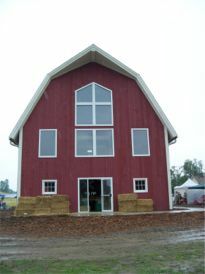 The original barn was also slated to be repaired and modernized. Unfortunately, it was completely destroyed in a fire in the summer of 2005 that also damaged the milkhouse and tool shed. The Society, the Park Dept., the architect, and the builders finalized the floor plans for its reconstruction in late 2006. A new barn now stands at the spot–one big enough to house such larger display items as plows, buggies, and other farm staples.